This entry was posted on July 4, 2009 at 12:15 am and is filed under Grain Elevator, Iowa, Rolfe. You can follow any responses to this entry through the RSS 2.0 feed. You can skip to the end and leave a response. Pinging is currently not allowed. And EXCELLENT connecting of the dots, Louise, from the grain elevator and flag to Independence Day. And so pleased to see the true meaning of Independence Day honored. Kudos to you! Again, love how vivid the photo is . 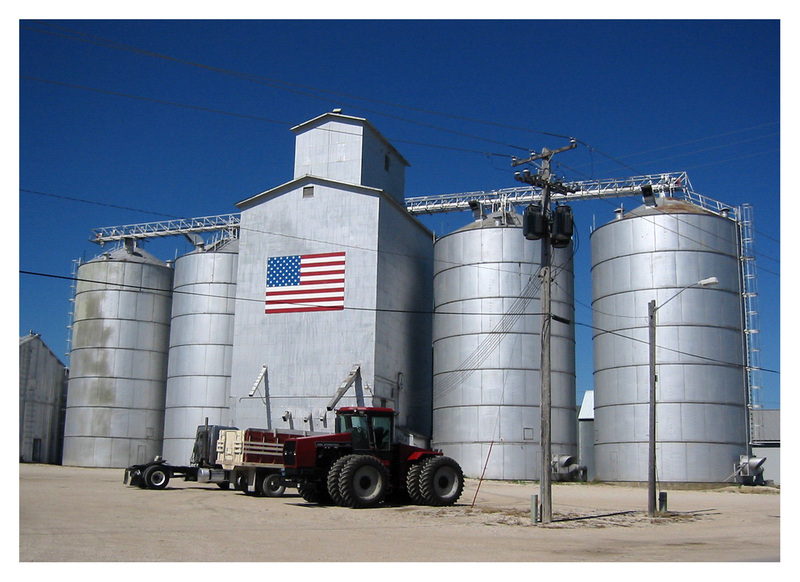 . . and all it communicates with grain elevators, flag, and farm implements. My “resident expert” says that in this photo are four steel bins (tanks), and a wooden structure grain elevator (that has steel siding so the wood doesn’t rot from rain, etc.). From the wooden structure grain elevator, a conveyor goes in each direction to carry grain to the four steel bins. These structures are pictured in the 1981 Pocahontas County History. The wooden structure grain elevator is much older than the four steel bins. I don’t see in the Pocahontas History that it gives the years for either, but if someone reading this knows, I’d like to be educated about these structures.